Armani Code Ice is a more modern, fresh and bright fern version. Armani Code Ice Eau De Toilette 75ml. 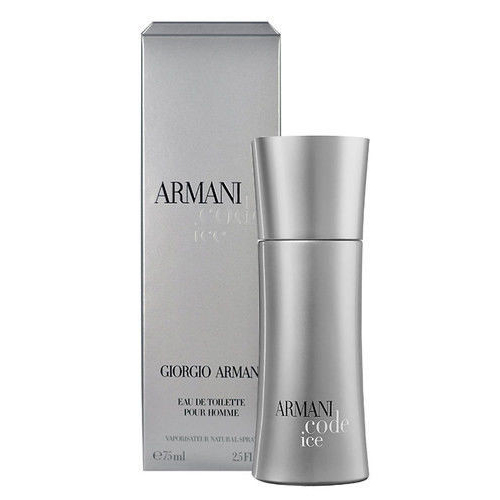 is a new version of the popular men's fragrance Armani Code, issued by the brand Armani in 2006. It is a more modern, fresh and bright fern version of the original perfume. Not for nothing in the name of the new version appeared Ice word. The aroma is really turned unexpectedly fresh, light, Mediterranean and at the same time very masculine. Perfume begins with the freshness of mint, bitter notes of lemon and a deep, spicy ginger accent. In the heart of the fragrance sounds bright and beautiful chord spicy notes of lavender and sweet, mint, herbal accents with bright notes of geranium. And all of this is framed by a magnificent trail luxury wood tones. New flavor - aromatic embodiment of modern man - an elegant and strong, vibrant and relaxed. This is a new flanker original flavor Armani Code, which was released exactly 10 years ago, in 2004. On the creation of Armani Code Ice perfumer Alberto Morillas worked. He composed a song from the music of lemon, clary sage, tonka bean, and added peppermint extract that gave flavor ice freshness. The personification of nature, concluded in flavor, was a Hollywood actor Chris Pine. He was named the face of Armani Code in February, and now with his participation came video, which was filmed in support of Armani Code Ice in Los Angeles, and its author was director Andrew Dominik. Video turned ironic: in the doorway of the building, Chris meets a girl, they quickly disperse each to his own, but the heroine (apparently conquered his fresh perfume) does not leave the impression made ​​by this man. She sees Pine in every passer-by. In the end, young people find each other, and Chris charmingly says, "I thought I lost you."